Your hives are prepared for winter and you are ready to relax by the fire and enjoy a nice hot biscuit with some drizzled honey on top. Now that there is nothing else you can do to help your hives for winter, you deserve that break. You have done all that you could, right? Wrap the biscuit and fluff out the fire, there is still plenty you can do for your girls. You may have not noticed any gusts of wind come through the bee yard during the summer but when you get hit with a 40 degree, 5 mph crosswind this winter, you will wish you had that windbreak. Imagine how bad that wind hurts your colonies. It could freeze them to death (literally). Now is the time to install that windbreak. Straw bales, shrubs, buildings, or anything that will create a barrier around your hives will help prevent those cold gusts from beating against them. Your hives will need good air circulation and ventilation throughout the winter.Ensure that your hive entrances remain clear of snow or other debris and include an opening (upper entrance) at the top of your hive. Moisture is detrimental to the hive during winter and if your hive does not have a way for it to escape, it could kill your bees. Insulating your hives will help against colder temperatures. This does not mean wrap your hive in insulation. Wrapping a hive can be more lethal than doing nothing. As we mentioned before and something we harp on every year, hive moisture is deadly during winter. Wrapping a hive can trap moisture and prevent it from escaping out the hive. The better option would be to use an insulated wintering board, empty super filled with straw, or even tacking on black tar paper (not covering any entrances). As the bees move up through the hive they will be consuming their stores of honey. When they reach the upper chambers in the hive, have an emergency feed when they run out. Fondant or sugar candy is a great winter feed that allows the bees to consume without breaking far from cluster. They also help in reducing hive moisture. Your hives can become warm housing for outside pests. During a cold winter, mice and other rodents may seek refuge inside a warm place. Place a mouse guardover the entrance to prevent pests from entering the hive and killing off your bees. Until those days that are too cold for you to go outside are here, there is still something that can be done for you hives. We are often asked by new potential beekeepers if they should start with one or two hives. We recommend that beekeepers start with at least two hives if possible. This is not a ploy to try to have you spend more money, but to give you the opportunity to compare and contrast each hive. Beekeepers with more than one hive can distinguish if a hive is weak or lacks brood compared to their other hive(s). This is vital information in these final weeks of warmer weather.If you did not have the other hive to relate it to, how would you know it was weak? Would you just assume the queen had slowed her laying in preparation for winter? What qualifies as a weak hive? The number of adult bees: We are not asking you to count each individual bee. Count the space between the frames that include bees. Beekeepers will want to see 10 or more frames of bees (donâ€™t count the spaces that are half full). Of course a good portion of the bees will be out foraging throughout the day so it is best to try and get a count prior or after the field force has returned. Amount of brood and food stores: You will still find brood in different stages throughout the brood chamber. Beekeepers want to see 3 or 4 frames of a good brood pattern and plenty of food stores to support the hive. We always suggest 50 to 60 pounds of honey per hive to survive through winter (depending on how mild the winter is). So what should you do now that you know your hive is weak? Once a colony becomes weak it can become overrun with disease and pests. These issues need to be addressed before any action can be taken in order to help your colony survive winter. By this time the colony does not have the population to fend off Small hive beetles or Wax Moths hiding in nooks and crannies. Reduce the size of the hive to something more manageable for your bees and apply traps to thwart off hive beetles. This will in turn help the current population maintain hive temperatures. Weaker colonies do not have the number of bees to address the issue of disease in the hive. These additional bees would clean out cells, dispose of infected larvae and deliver nutrition to the younger bees. Therefore, you need to provide feed with a nutritional feed supplement to increase your colonies health and entice brood rearing. Some diseases need to run their course through the current population and hopefully the newborns will not show the same symptoms. If disease is still evident in the newer population you may need to recheck your hiveâ€™s mite count. Other diseases are more devastating and require the hive be torched (literally burn the hive). For more information on pests and diseases please visit our Pests and Disease page. You are on the correct path to strengthening the colony. Continue feeding the colony a 2:1 ratio of sugar to water (mix in a feed supplement to help increase the colonies health) and provide a pollen substitute. Plants are not currently producing pollen and pollen is the main ingredient used to feed young larvae and the queen. Feeding the colony will stimulate the queen to increase her laying and will grow the colonies strength. Hive top or division board feeders work better when feeding in the fall. The warmth inside the hive may keep them from crystalizing and robbing bees will not be able to reach them easily. Weaker colonies are prone to experience robbing from stronger colonies and entrance feeders are easy access for robbing bees. If you must use an entrance feeder, reduce the entrance to the far edge away from feeder. If your colony does not seem to be improving in strength you can combine it with a strong colony to help the bees survive through winter. Ensure that the weaker colony is not diseased or infested with pests. Otherwise, you may weaken the strong colony when combining. Remove the queen from the weaker colony (a very important step) and lay newspaper over the colony you wish to combine it with. Stack the weaker supers above the newspaper. The bees become acclimated with each other as they eat through the newspaper. There is no point in nursing a weak colony along in hopes that it will gain in strength. It will continue attracting pests and disease. Combining colonies in the fall can lead to strong splits in the spring. Remember, now is the time your colony is preparing for winter. The bees reared in September and early October are the young bees the colony needs to survive winter. If they are not completely healthy, they may not survive. At this time of year you should be concerned about two things - mites and nutrition. Treatments should have been applied if you had higher than normal levels of mites in you hive. It never hurts to recheck the colony once the treatments have been removed. Don’t always assume your treatment was effective. The Varroa Mite can build a resistance to some treatments if you use it year after year. Monitor your infestation levels and alternate with different medications if you find your treatment was ineffective. It's no surprise; nutrition can either help or hinder a colony. If the colony is diseased, poor nutrition can amplify the symptoms, but good nutrition can be the elixir needed to get them through. This time of year, nectar is scarce or non-existent. Bees will forage for what is out there but beekeepers need to provide a food source to prevent starving in the hive. Be sure the bees have ample honey or syrup stored and protein! Honey B Healthy. This feeding supplement is used in spring and winter to stimulate the immune system. This feed stimulant with essential oils prevents mold and fungus in sugar syrup, calms bees when used as a spray, builds colonies when fed during dearth and much more. The scent of spearmint and lemongrass will attract your bees to feed almost immediately. Amino B Booster. A blend of free amino acids that assimilates rapidly and directly through the mid gut to the bee’s hemolymph and hemocytes, then transported to the sites where protein is needed for bee growth. Amino B Booster provides your bees the nutrients they need when pollen is scarce or lacks the nutrients bees need. Vitamin B Healthy. Helps provide needed nutrients vital for bee health especially when pollen sources are scarce or the pollen lacks the essential nutrients the bees need. Helps build strong healthy colonies for maximum honey production and pollination or can be used to help build up weak, over-winterized colonies, packages, nucs or swarms. Hive Alive. A feed to help bees maintain colony strength. Prevents syrup from fermenting and helps bees absorb the nutrients, proteins and sugars needed to increase brood production. Hive Alive strengthens the bees’ immune system to help manage intestinal issues and other diseases. A colonies health is as essential for winter survival as are the food stores they will need to survive. Providing the necessary feed the will need along with a good supplement will go a long way to keep your hive healthy and strong. After storing your honey for several months it now appears cloudy. Do not be alarmed, your honey has crystallized. Crystallization is not an indication of your honey worsening or deteriorating. Crystallized honey is not harmful or expired. Crystallization is the natural process of honey when it leaves the hive. Honey can even crystallize in the hive if your colony is unable to sustain hive temperature in honey super. You will find that some honeys will crystallize faster than others. Honey is a highly concentrated sugar solution with more than 70% sugar and less than 20% water. Fructose and glucose are the two primary sugars found in honey. Glucose will crystallize faster due to its low water solubility. The ratio of these two sugars will determine how quickly your honey will crystallize. This is why some honeys will last months or years without crystallizing while others will crystallize within weeks of extraction. Temperature. Storage temperature has a huge influence on the crystallization process. Storage temperatures between 50-60 degrees Fahrenheit are ideal temperatures for crystallization. Temperatures below 50 degrees will slow down the crystallization process as the honey becomes thicker. Honey will resist crystallization at higher temperatures above 70 degrees. Crystals will dissolve when temperatures exceed 104 degrees Fahrenheit. Particles. During extraction particles of debris are caught by the honey. Pieces of beeswax or pollen grains will act as a base for the glucose crystals. Unfiltered honey contains a higher number of particles; therefore, it will crystalize faster than finely filtered honey. Also consider the particles in air and be sure to allow your honey to settle before bottling to allow air bubbles to be released. Honey can be returned to its lucid form if it becomes crystallized. Gently warm the honey by placing the bottle into a water bath or, depending on size of container, a sunny window. Do not heat honey beyond 104 degrees or it will destroy enzymes, begin to caramelize the sugars and alter the flavor. Heat the water bath slowly and bring the temperature of honey up to 95 degrees Fahrenheit. Heating must be done with care if the honey is to retain its nutritional value. If you have left your honey in pails, use a melt belt to bring the honey temperature up to a safe range or use a honey bottler & liquefier as a double boiler. Some honey enthusiasts enjoy honey in its crystalized state. It is easier to use in cooking and will spread better on toast. See what your customers prefer. While swarming occurs naturally as a means for a colony to reproduce, it may leave the existing colony in peril. The swarming colony leaves behind a virgin queen that must return safely from her mating flight. If the virgin queen is not properly fertilized or she does not return safely, the hive is set for doom. What are beekeepers supposed to do? Size of the Brood Nest. Honey bees instinctively decrease the size of the brood nest in preparation for swarming. Imagine a populated colony capable of caring for ten full frames of brood. After swarming, half the population will only be able to manage half the amount of brood. Room will be alleviated to store nectar and pollen as the colony begins to reduce the size of the brood nest. Beekeepers may mistake this as a honey bound hive when in fact the colony is prepping to swarm. Swarm Cells. These are indicators that your colony intends to swarm. Multiple queen cups which are clumped together at the bottom of a frame are indeed swarm cells. Swarm cells are produced in preparation of swarming. At this stage it may be too late to prevent the colony from swarming. Size of the Queen. Locating the queen within a hive can be difficult; therefore, noticing a reduction in her size is nearly impossible. In order to prepare for swarming the colony will reduce the amount fed to the queen so she will lose weight. For the queen to be able to fly with the swarm, she must lose weight. Congestion. Bees prosper from a crowded hive but can easily become overcrowded. A populated brood chamber allows the bees to maintain brood temperature, prevent robbing, and manage pests. A hive’s population size is directly related to the health of the colony. Once the hive becomes congested the colony can support being divided without compromising the survivorship of the parent or the swarm. Abundance of Resources. The availability of resources corresponds to the congestion of the hive. The queen will be laying heavily as long as resources are brought into the hive. Bees work to bring in the resources they will need for survival. Nectar and pollen will be stored in cells that brood recently hatched from, eliminating the space the queen needs to lay. The hive becomes honey bound and the colony may swarm. Old Queen. The presence of an older queen bears a minimal influence on a hives inclination to swarm, but an older queen is more likely to swarm. The queen’s pheromone levels decrease as she continues to age. The colony will begin to raise a new queen when they sense a decrease in the existing queens pheromone and the existing queen will swarm from the hive. Checkerboarding. An overwintered colony will have a goal to send out a reproductive swarm but checkerboarding may help prevent swarming. Checkerboarding allows the brood chamber to continue expansion and prevents a honey bound hive. Once the colony is able to survive a majority bee-loss it switches from build-up to swarm mode. The goal of checkerboarding is to keep the colony in the build-up phase. Checkerboarding encourages the bees to expand the brood nest and honey stores until the colony is less apt to swarm. Conceptually, checkerboarding tricks the bees into thinking the brood nest is smaller than its actual size. The premise of checkerboarding is to open the brood nest by alternating brood frames with empty frames, creating a checkerboard pattern (black, white, black, white…). This will take one large brood nest and break it up into multiple brood nests. Rotate empty frames from the outside of your brood chamber with fully capped brood frames, creating the checkerboard pattern. If all frames are filled with brood and you are using similar sized supers, rotate frames up or down a story to accomplish the checkerboard pattern. If you use one deep and the rest medium, move frames into a split hive to accommodate empty frames. The division of the brood nest is based upon the population of your hive. If your hive is not populated enough to fill empty bee space to keep brood warm consider splitting every two frames or divide the brood nest in half with one frame. Checkerboarding is a preventative measure to swarming but it is not a guaranteed method. If the colony is insistent upon swarming, nothing may prevent it from happening. Have your Cardboard NUC handy in case they do end up swarming. It is always exciting to find a swarm (except if it is from your hive) because, as a beekeeper, you know those are free bees. Swarming is a natural means for a colony to reproduce. Bee colonies are considered superorganisms and may swarm/reproduce several times throughout the season. 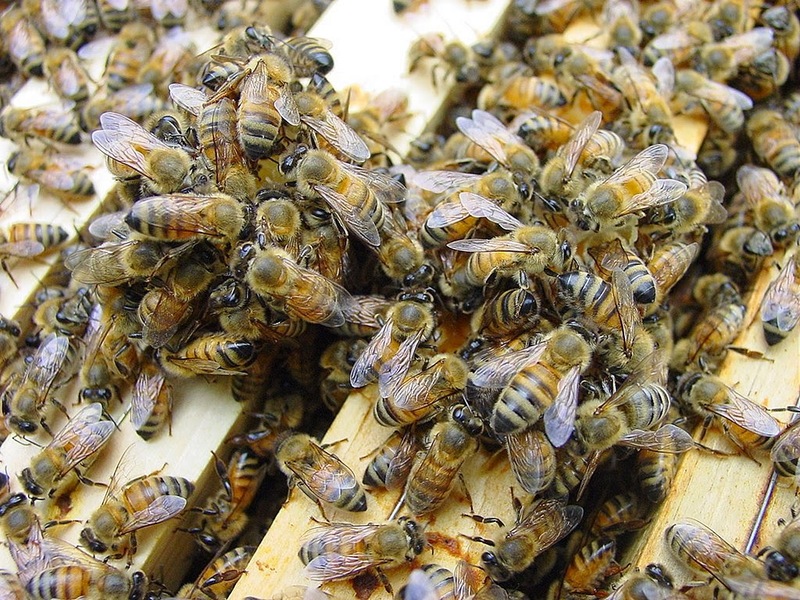 Swarming season will typically happen after the queen has made it through winter, leading into the spring or early summer months. A newly established colony does not have the tendency to swarm but may, if they become overcrowded. 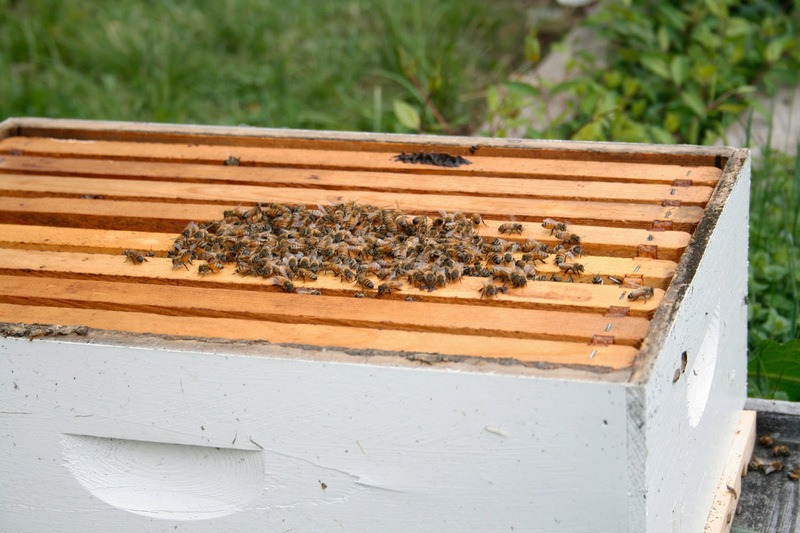 When working the frames in a beehive, you can find swarm cells clustered together along the bottom edge of a frame. When a hive decides to swarm, they will send out scout bees in search of a new home. This process can happen very fast (within a few hours) or they may search for a couple of days before finding a suitable home. While scout bees are searching for the next home, the swarm will find temporary resting points relatively close to their original hive (roughly 50 to 100 feet). Generally, swarms will find shelter on tree branches but can find rest on any style structure.This is your time slot to go out and capture them! Grab your NUC (cardboard or wooden) to put them in and head their way. So, you have located a swarm, what do you need to do when you find this swarm? A swarm may seem overwhelming and frightening but during this stage, they are not aggressive. Locate the swarm, they may have landed 1 foot off the ground or they could be 80 feet up in a tree. Access the situation and determine if the bees can be acquired safely. Use Protection: You never know when a mistake will be made, therefore, wear your protective equipment. You are handling thousands of stinging insects that may become aggressive. Wear your veil and gloves (depending on comfort level with bees)and remind any spectators that bees can sting. You have spotted the swarm and are ready to transfer them into your NUC. Swarms on Branch Accessible from Ground: Lay a white sheet out below the swarm. Take your NUC box and determine if the swarm is small enough to bump into the NUC. If it will fit perfectly, go ahead and give it a couple bumps to dislodge the swarm from the branch. If it exceeds the NUC box, try to get the center cluster inside the box, leaving the outskirts to fall onto the sheet. Swarms on Branch Accessible by Ladder: Place a white sheet below the swarm. Stand ladder on top of the white sheet so that you can easily reach the swarm.Determine if the bees can be acquired safely. Safely carry the NUC box up the ladder to dislodge the swarm into the NUC (best done with two or more people for support). Swarms on Something Other than a Tree Branch: They may have come to land on a fence post, roof overhang, or even on the ground. The main objective is to transfer the large cluster without disrupting them continuously. The best procedure is to spray them down with a sugar water, making it difficult for them to fly. Lay out your sheet below the swarm (as best you can) and brush them into the NUC. Try to acquire the main cluster in the beginning and then retrieve the bees on the fringes. The sheet is placed underneath the NUC in order to catch any bees that didn’t make it into the NUC. The sheet will also help any stragglers find their way to the main cluster. Take your NUC and the sheet to where you intend to place the colony. At this point if you are using a wooden NUC, you can leave them be until they are fully established. Add the frames that are needed and place the top on. If you are using a cardboard NUC, you will need to transfer them into a permanent 8 frame or 10 frame hive. Place the sheet so that it leads to the entrance of their new hive and set the NUC so that the opening faces the hive. The bees will walk right up the sheet and into the hive. Capturing the Queen is Key! To successfully acquire the swarm, you must retrieve the queen. She is likely to be in the center of the swarm, surrounded by the cluster of bees. She will be extremely hard to determine or locate, as she will have lost weight in order to fly. After capturing the swarm, check back in a couple weeks to ensure she is laying. Treat this as a new colony and FEED, FEED, FEED! If your colony does swarm, have your NUC box handy to go out and retrieve it. Check the hive that swarmed and ensure that they are left with a laying queen. Now one hive just became two! You have set up your hives and installed your bees with the queen cage attached to a frame. We know that you are eager to check on them to see how they are doing but disrupting the colony will hinder them. Give them time to acclimate to the new queen and release her on their own (will typically take 5 to 7 days). Once you have given them time to release the queen on their own, you can open up your hive and see your bees hard at work! When you first open your hive to remove the queen cage, you may notice no substantial changes, but your bees are working frantically to draw out comb, allowing space for the queen to lay her eggs and room to store their nectar. There will be some foraging bees sent out to bring in nectar and pollen but the majority of the force will be building up the frames. Providing feed during this time is vital. As the bees work the frames, they will be consuming feed almost as fast as you are providing it for them. Keep the feeder on the hive! Don’t be frightened to find that your colony seems smaller then when you installed it. This is a new colony and it will take them time before they will grow in population. The population will begin to decrease before it starts increasing because the newly laid eggs must be raised out to replace the older bees. 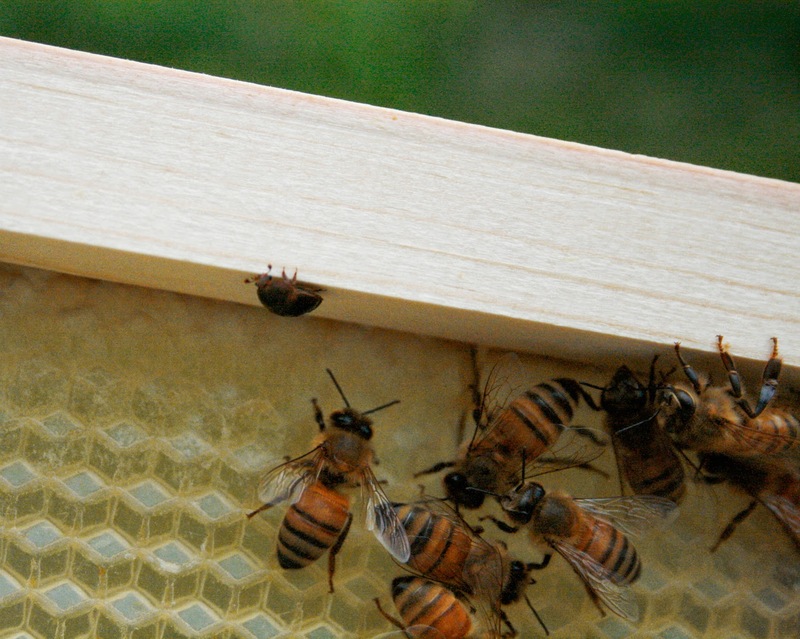 As the bees begin to work the frames, drawing out foundation, they may draw out a queen cup. There is no reason to fret. A queen cup does not mean your hive is queen-less, but is a precautionary measure your worker bees take to ensure they can raise a new queen quickly if something were to happen with the current queen. A queen cup is a single cup which is located in the middle of the frame. It should not have an egg or larva inside. When you begin working your hive, your first instincts are to look for the queen. 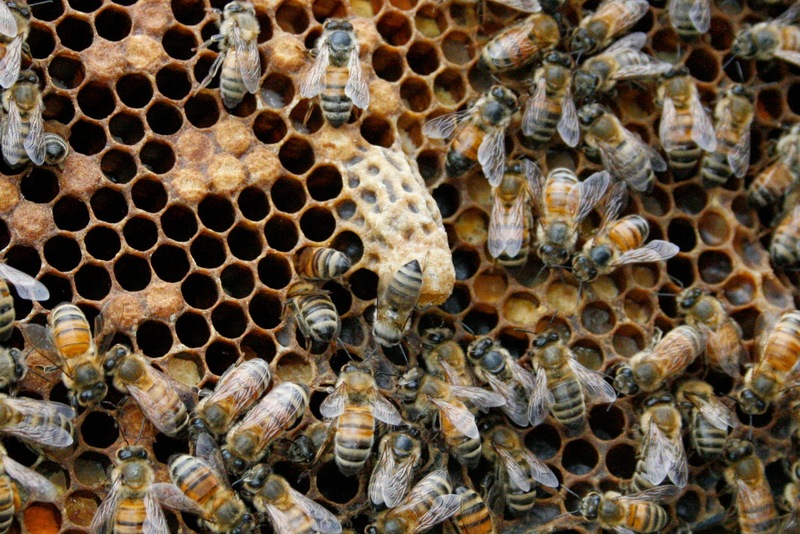 The queen is one of thousands of bees throughout the hive. Although she is much larger than the worker bee, she will be extremely hard if not impossible to find. An alternative is to check the frames for eggs. Eggs signify that the queen has been released and is laying. Eggs are also difficult to see (less difficult than finding the queen) but they appear as small white kernels that are similar to rice. You will tend to see other insects in your hive that you would not expect. Most hide out on the inner cover, away from the colony. These can include earwigs, spiders, roaches, and many more. These common insects do not cause any damage and tend to stay for the heat, dark and shelter of the hive. There are some insects that can cause damage within the hive. These would include the small hive beetle and wax moth. They will lay their eggs in the hive and can destroy comb. The wax moth is more of a concern in late fall when equipment is being stored. Small hive beetle is a year round problem that can be maintained. A strong colony will keep a check on the hive beetle but if there population begins to rise, insert a beetle trap into your hive. After installing your bees, you will place frames back into your hive. Inevitably one or two frames will be spaced too far apart, leaving room for the bees to draw out excess amounts of comb. 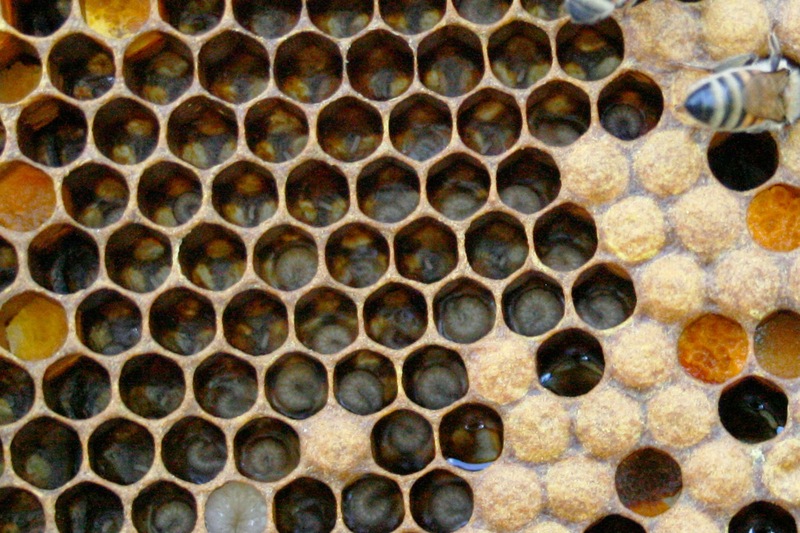 You can leave the burr comb in the hive and the queen will lay eggs or workers will store honey in the cells, but the burr comb will limit what can be worked on adjacent frames. 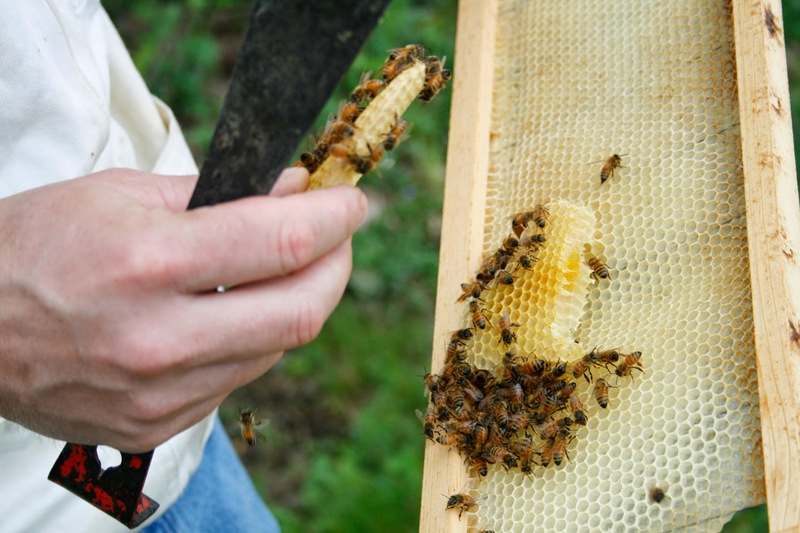 For the best results within the hive, remove the burr comb and take the time to space out your frames evenly. Burr Comb can be melted down and used in candle or lip balms. Installing your package is just one of the first steps into this exciting hobby. Once your queen has been released and starts laying eggs, you will begin to see a large field force in your garden, buzzing from flower to flower. A simple, easy way to make skin cream using ingredients from the bee hive! Shea Butter – Some UV protection. Soothes sunburn, psoriasis and eczema (skin conditions). Dry skin, wrinkles, and stretch marks. Sweet Almond Oil – Easily absorbed into the skin. Used in Aromatherapy, soothing effect for relaxation. Creates a healthy look. Olive Oil – Prevents evaporation. If applied to skin, prevents further loss of moisture from skin. High in antioxidants soothes sunburn, psoriasis and eczema. Coconut Oil – Helps hold moisture. Does not rub in easily and may become greasy, be sure not to use too much in recipe, does make skin soft. Palm Oil – Antioxidants and antibacterial. High in antimicrobial properties that help with skin complexion. Beeswax – Creates a protective non-clogging layer. Hardener, Antimicrobial, moisturizing. Works well in emulsions. Honey – Improves skin moisture. Antioxidants. Antimicrobial. Beeswax and honey are excellent for your skin. Most people tend to think that beeswax creates a heavy film over the skin, that is not the case when incorporated with other ingredients. 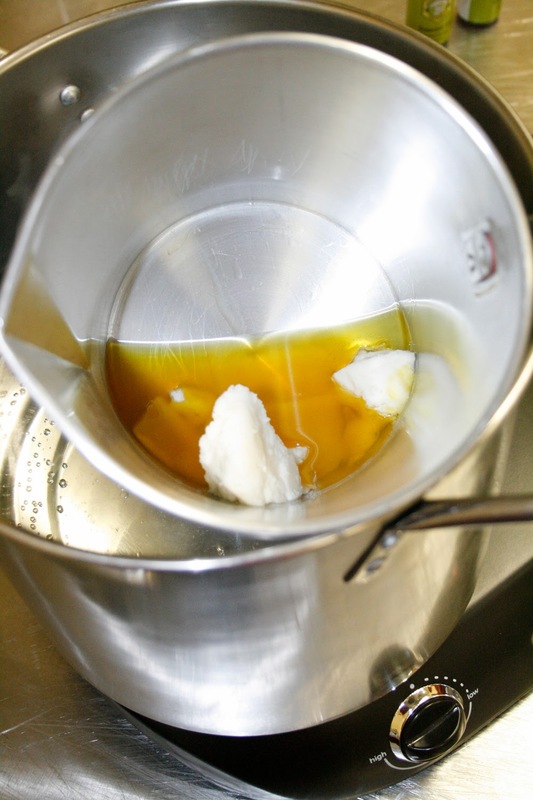 The oils and butters are soft ingredients that have a low melting point. With the addition of Beeswax, the lotion will become more solid and easier to apply. Most recipes you find will include water, and you are going to be mixing the water with oils and fats (do not mix without and emulsifier). 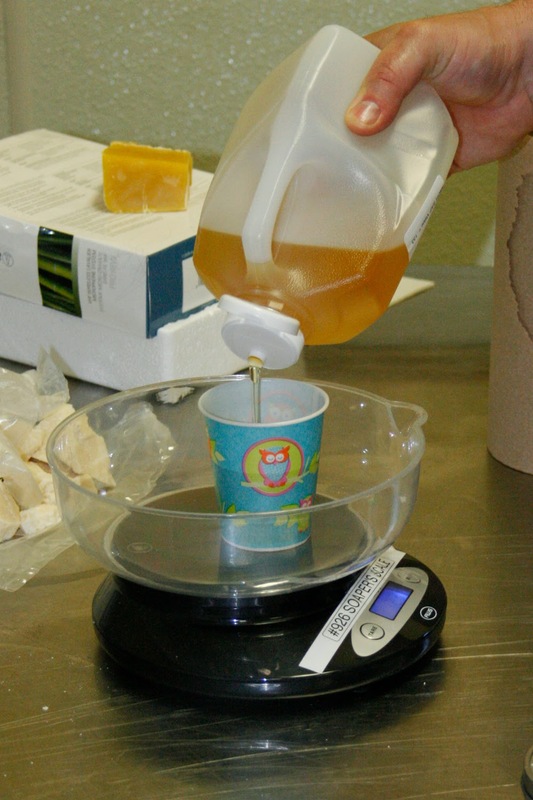 Beeswax is not a stand alone emulsifier but does work well in emulsions and acts as a hardening agent. You may also add many other ingredients: Essentials oils for scent, propolis, pollen, other oils, aloe vera gel from a aloe vera plant... ect. Before you get started make sure you have everything you need. The ingredients listed in the recipe above, a pouring pitcher that will create a double boiler using a larger pot (make sure your pot is large enough to put your pouring pitcher in; can use a 1 quart or 2 quart pouring pitcher whichever you prefer), containers to put the finished product in, spatula and a whisk. You will need a round bottom mixing bowl placed in a container filled with ice water to create a cold bath for one of the final steps. 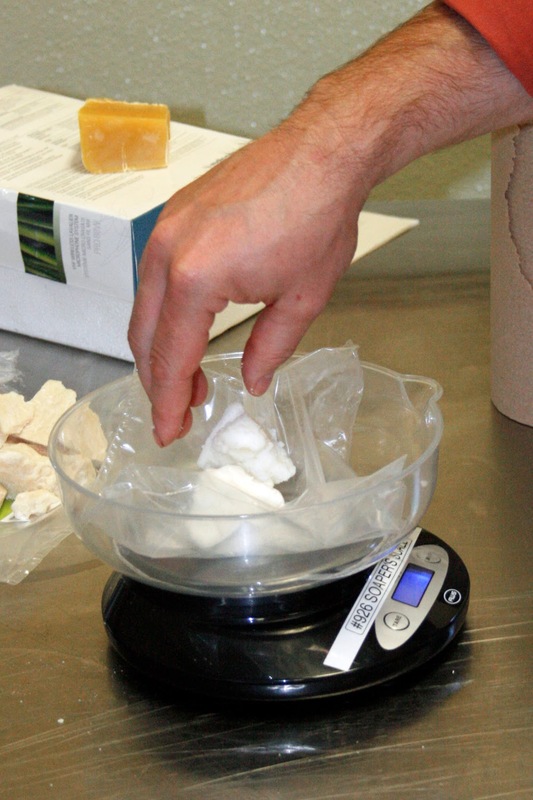 Weigh out all ingredients using the digital scale. Combine and melt Shea and Cocoa Butter in the Pouring pitcher. Leave Olive Oil in a separate container to be added in later. Once all the ingredients have melted, remove from heat. Pour the melted Shea and Cocoa Butter into your mixing bowl that is in ice water. Add Olive Oil into the mixture. Timing is key to get the perfect consistency but it is not critical. If you do not mix the ingredients until it becomes opaque, the skin cream will be gritty but application will be the same. Trapped air bubbles tend to be an issue if it is under whipped. If the mixture is over whipped, it will be thicker and difficult to pour into containers (must be spooned out causing an uneven surface within the container). If you desire a smooth surface, use a blow dryer to fan the container with hot air until the surface of cream is smooth (do not apply direct heat). NOTE: If you decide to make changes to the recipe make sure you keep track so that the next time you make the skin cream you will have the exact amounts. Weigh it out so there is no guess work. We want to provide as many resources to help beekeepers succeed. Every year we host an Online Bee-Ginner's class that typically consists of 4 sessions in which we go over the basics of beekeeping and explain what being a beekeeper entitles. If you are unable to attend the online class, we record each session and offer a DVD after all sessions have been completed. 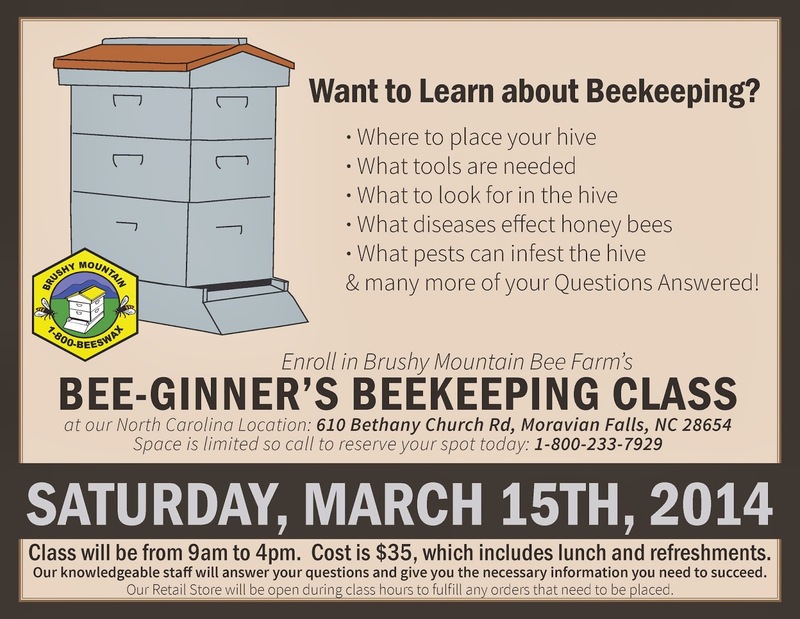 For those who are in the surrounding areas of our North Carolina Branch, we hold an on premise Bee-Ginner's class where you will be able to learn the fundamentals of beekeeping. We want to ensure you are well informed before you set up your hive and install your bees. We host this class in advance of our Bee Days so that you will feel more comfortable installing your Packages or NUCs. 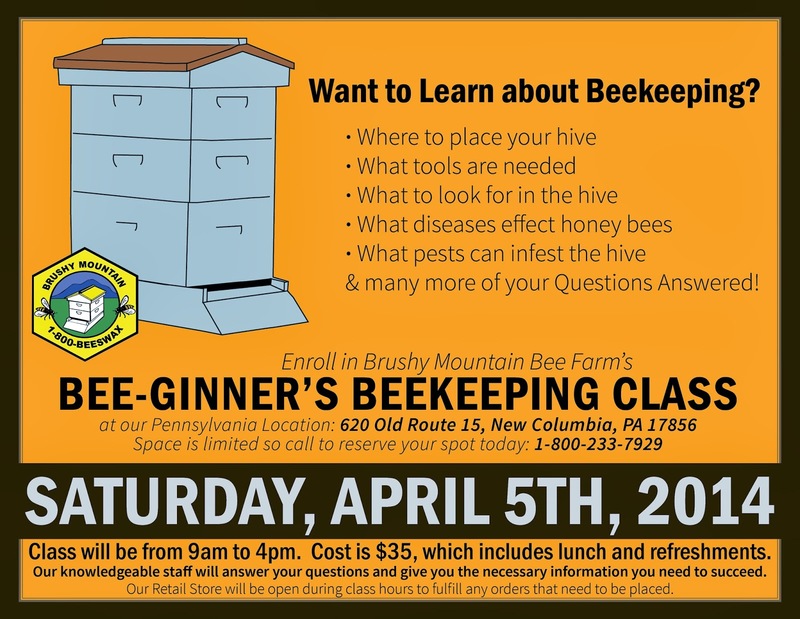 For those in Pennsylvania and surrounding areas, we offer a Bee-Ginner's Class at our PA Branch. We know that the beekeeping season in the north is different than the south, so our Bee Class and Bee Days are later in the year. These are great opportunities for novice beekeepers as well as those who have been keeping bees for many years. We provide great information and our knowledgeable staff will answer your questions and give you the necessary information you need to succeed. Our Retail Store is open during Class Hours (on premise Bee Class) and on Bee Days to fulfill any orders that need to be placed.